It felt a bit weird to be painting after a longer break. Working on these guys took much longer than I had expected. 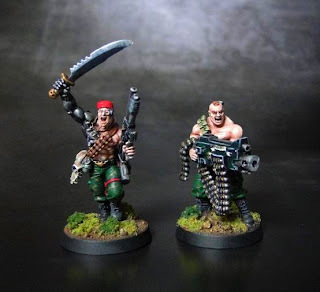 I generally like minis of Catachan jungle fighters and these two are no exception. I like the sculpts, details abound and the quality is overall quite high (well, apart from details on the face, especially eyes that are simply not there...). Anyway, I had fun painting Colonel 'Iron Hand' Straken and Gunnery Sergeant Harker. 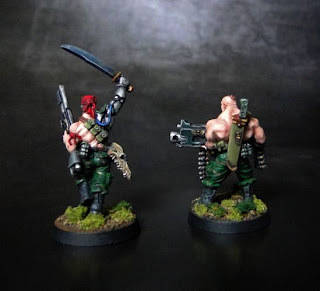 The quality of the pictures is poor as it's dark, cloudy and rainy today and I had to take these pictures before sending the minis to the commissioner. Meanwhile, I finally got a very nice cabinet, which I will use to show case my minis and store those that await painting. I will add it to my workspace this weekend and show some pics once it's ready.